It’s really rather important to know if a chemical will or will not penetrate into the skin. It can be a matter of health & safety or it can be a matter of beauty (even if that is only skin deep). With strong pressure to reducing the amount of testing on animals, it’s important to find alternative ways to screen chemicals for their ability to penetrate the skin. Having a high scientific confidence that a chemical can or cannot thermodynamically penetrate the skin can reduce the need to test. If you are confident that it cannot penetrate then it is unlikely to be a useful beauty aid, but it is equally unlikely to pose a general safety hazard by skin penetration. This approach is not enough on its own to guarantee efficacy or safety, but it is a very good starting point. One possible approach is to find directly the HSP of skin. Clearly this is impossible as skin is a complex multi-component system. But a reasonable starting point for such measurements is abundantly available – psoriasis scales. (see Hansen, C.M., and Andersen, B.H., The Affinities of Organic Solvents in Biological Systems, Amer. Ind. Hyg. Assoc. J., 49, No. 6, 301-308 (1988)). The usual multi-solvent test, using swelling/non-swelling as a criterion, gives δP & δH values (9.3, 15.6) which are credible and a δD value (>25) which is not. The reason for this large D and large radius is unknown, but we present the data for you to reach your own conclusions. The values are [17.6, 13.5, 10.2, 4.3] which are reasonable. The Radius is a rather small 4 which means that rapid skin penetration is quite restricted – which seems to be another triumph for evolution as a large R would make us rather too susceptible to harm via our skin. 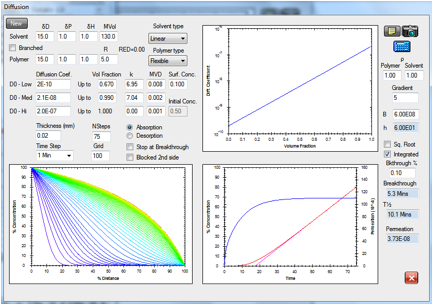 Suppose you wanted a reasonable polymer model for skin penetration. Clearly you need a polymer with HSP close to that value. In the software you can find one easily. Enter these parameters as the final row in the Polymers list. Now double-click on that row. 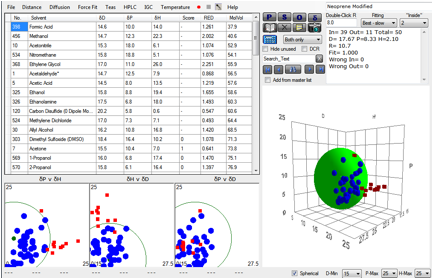 The software finds the optimum match (best mutual overlap of the two radii) between Skin and the other polymers. 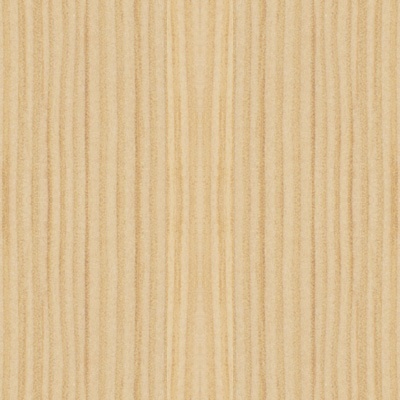 High in that match is polyurethane. So if you want to test chemicals for skin penetration, have a go first with a polyurethane. Not surprisingly, the test industry has found that polyurethane can be a useful test substitute for skin. One example involved tests of adhesion to skin. Testers preferred to have the adhesive stick to the polyurethane rather than pull out the hairs from their skin. Now let’s set ourselves the target of protecting our skin from a solvent or chemical which from HSP criteria would be likely to permeate and which from chemical intuition might be likely to be harmful. 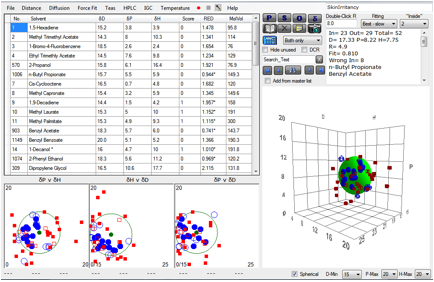 By loading the full Solvent Sphere Data set and then entering the Skin parameters as an additional row, the double-click trick gives a list of chemicals that match skin closely. From that list, something like Ethyl Isothiocyanate sounds like something you wouldn’t want to get into you via your skin. Select that row. Now go to the Polymer form and click the Polymer button. This automatically finds the best match to the selected solvent. Polyurethanes are near the top so they should not be used for protection as they afford little added protection against chemicals, even though comfort may be at a maximum. Now go to the bottom of the table to find the worst match. Of the practical polymers that can be used for gloves there’s no surprise to find that simple PE or PP gloves should be more than adequate to protect you from this chemical, though they are often too stiff for comfort and use. The ubiquitous Nitrile glove is also in this region. Whilst we’re on the subject of gloves, there’s an interesting data set which seems, at first sight, to undermine HSP thinking on permeability. Here is the entire data set for 1hr breakthrough times for Neoprene. The fit is awful and out of 66 solvents, 13 of them are “wrong”. So does this mean that HSP are useless? Any scientific tool used without thought can lead you astray. Arguably the bad fit above is a mindless use of HSP. Because this correlation is based on breakthrough times which in turn depend on diffusion coefficients, it’s obvious that molar volume must play an effect. In this case, Kinetics must be significant, whereas HSP, as stated at the start, assumes pure Thermodynamics. So let’s try to exclude gross kinetic effects from the calculation. Let’s exclude all very small molecules, say below a molar volume of 70. And let’s exclude all very large molecules, say, above a molar volume of 200. What do we then find? Now we get a perfect fit with no “wrong” solvents. It’s probable that this is a pretty good set of HSP for Neoprene. But how valid is what we’ve just done? Only you can decide according to your own application. Fortunately, HSPiP allows you to play “what ifs”. If you happen to know that there is a very good reason for excluding methanol, but not the other small molar volume molecules, you can try another fit. Or, as it turns out, the real problem is the apparent slow diffusion of the largest molecules within the film. Excluding those, on the reasonable grounds that the lack of permeability was a size effect, gives a value not too different from the one above. So using HSP involves some judgement by the user. But that’s no bad thing and at least one’s judgements, as in the above “good” fit, are made explicit. And there is a really important point that should be emphasised. If a large solvent has a RED>1 you can be reasonably certain that it will not permeate. If a small solvent has a RED<1 you can be reasonably certain that it will permeate. A small solvent with a RED>1 is problematical, but you would be wise to assume that it will get through. A large solvent with a RED<1 is likely to permeate if you give it a longer exposure time, so if you are serious about glove protection you would be cautious about such solvents. In other words, even though we have admitted some margin of error, there are still quite a lot of things you can conclude with some degree of certainty. And as ever, consider the alternative. If you didn’t have the HSP approach, how would you be able to form any sort of scientific judgement? We are always on the lookout for independent checks on HSP ideas. We were therefore very grateful to Martin Barratt, formerly of Unilever, for allowing us to attempt to reinterpret his data on skin irritancy published M.D. Barratt, Quantitative Structure-Activity Relationships for Skin Irritation and Corrosivity of Neutral and Electrophilic Organic Chemicals, Toxicology in Vitro, 10, 247-256, 1996. A range of chemicals was classed as either Irritant (1) or non-Irritant (0). The author (who was interested in QSAR interpretations of the data) admits that the data themselves are not perfect as they come from a variety of sources, so from the start we would not expect a great fit. 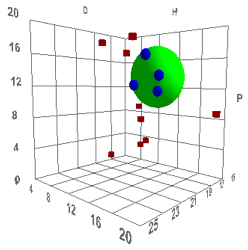 And our calculations of the HSP of many of the molecules cannot be expected to be highly accurate. Nonetheless, a reasonable fit emerges giving values [17.3, 8.4, 7.7, 5] not too far from those of the skin permeability test [17.6, 13.5, 10.2, 4.3]. We confidently predict that with some larger, more self-consistent data sets on both skin permeability and skin irritancy, better fits and better matches will be found. If such data are produced we will be happy to use it in future editions of this book whether our prediction is proved right or wrong. We might also suggest the inclusion of solvents with high polar parameters, such as those used in the skin permeation study reported above. Highly polar solvents are not found in the above data set, a fact that puts a bias toward a correlation with a lower polar parameter. Our suspicion is that these would permeate/irritate based on the skin permeability correlation presented above. If these were included in the irritancy data, the result would presumably be a higher polar parameter, a situation which would give even better agreement with the permeation correlation. The famous Potts and Guy correlation between skin permeability coefficient and LogKow (the octanol/water partition coefficient) + Molecular Weight has produced conclusions entirely opposite to the ones above. It seems self-evident to many in the skin permeation community that chemicals pass through the lipid layer, with the corneocytes being mere passive bricks. It is slowly becoming clear that this lipid-only route is a myth. This is not to criticise the Potts and Guy paper. It’s simply that it’s quite straightforward to produce a similar graph (discussed below) “proving” a strong correlation with water solubility. If this graph had been published instead of the LogKow graph then a water-only myth might have sprung up instead. The truth is much more interesting than either myth. At the heart of the mythology is a split into two different worlds. The first one, represented by the HSP work above (itself driven by issues of chemical safety), is concerned with the migration of small molecule liquids (e.g. solvents, acrylates…) into skin. These are often presented to the skin as pure liquids and the fact that they often swell the skin is good evidence that the skin really does have high values for δP and δH, totally untypical of a lipid-only route. The second world is one where the pharma industry need to get large molecules to go through the skin. The permeation rates are painfully small. “Permeation enhancers” are often used to speed things up, giving, often, a factor of 2-5 in Jmax, the maximum flux. The literature on permeation enhancers is highly confusing. Because the lipid-only route is seen as objectively true, then lipophilic molecules should be excellent enhancers. But by far the best enhancers are water, ethanol, DMSO, NMP etc. Their enhancement is explained away as being pathological. Ethanol, for example, is often said to be a “lipid extractor” which does the enhancement by ripping out the lipids, allowing the permeant to go through a destroyed skin. This happens to be nonsense. Ethanol is a useless lipid extractor, as you would expect from its large HSP distance from typical lipids. Some classic enhancers such as Azone have a lipid tail, but their HSP are not particularly low. The terpenes can sometimes be good enhancers – and are seized on as proof of the lipid route. But sadly the evidence shows that usually they are pretty useless unless combined with other elements of the formulation such as ethanol. If you read the skin permeation literature it is quite painful to see authors trying to explain results in crude terms such as “lipophilic” or “hydrophilic”. The term lipophilic is a cause of much confusion. A good way to think about it is to ask “What is the opposite to lipophilic?” A typical answer is “Hydrophilic”. But next ask “What is the opposite to hydrophilic?” The answer is ambiguous. It can be “Hydrophobic” or it can be “Oleophilic”. What is missing from the discussion is the key fact that octanol is not particularly hydrophobic – water is soluble to 20% in octanol. The Potts and Guy correlation is not with a Octane/Water partition coefficient which is a much stronger hydrophobic/hydrophilic measure. Another key fact often missing from the debate is that the lipid bilayer contains ~25-30% cholesterol. The HSP of cholesterol [20.4, 2.8, 9.4] mean that it insoluble in both ethanol and hexane, but a 50:50 mix is not a bad solvent (though the δD match is bad). It is really more comfortable in, say, chloroform or 1,4 dioxane than in any typical “lipophilic” solvent. So the heart of the lipid bilayer itself is not particularly lipophilic. One clue to resolving this situation is mentioned above. The terpenes often give good permeation enhancement when used with drugs formulated in ethanol. It’s often difficult to untangle precise quantities being used, but it turns out that many formulations contain approximately equal quantities of terpene and ethanol. If you do a quick HSP check, it’s no surprise to see that the HSP of the vehicle is close to that of skin. In particular, the cyclic structures of the terpenes provide a boost to δD necessary to get up to the skin value. Once the skin permeation literature is approached as an exercise in solubility a lot of things start to make sense. The behaviour of many permeation enhancers looks a lot more explicable in this light. But let’s go further. Let’s think through all those pharma molecules. The Potts and Guy correlation is with permeation coefficient. But we don’t actually care much about that coefficient. Instead we are interested in Jmax, the maximum flux. 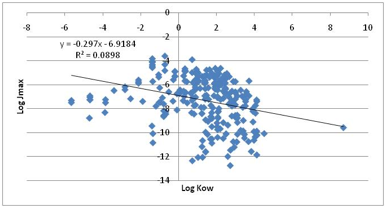 One plot which shows an interesting correlation (but nowhere near as good as the molecular size which they rightly concluded was the strongest single correlation) show Jmax versus LogS, the water solubility. 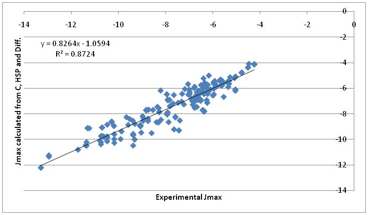 Figure 1‑7 Jmax correlates much better with water solubility! The more water soluble the compound, the higher the Jmax! This is the plot we mentioned earlier which could have launched an alternative (and equally mythological) “hydrophilic only” skin permeability hypothesis. Dr Cross’s team were able to improve their correlation somewhat by including melting point. Why should this be so? Because melting point, as discussed in detail in the Predictions chapter, has a major influence on solubility. where C is a term based on the melting point (and is 0 for a liquid), E is the “combinatorial entropy” term which we can ignore given the margin of error in all these data, A is an Activity Coefficient term and H is a Hydrophobic effect term when considering solutions in water and alcohols. This too can be ignored in this simple analysis. A can be estimated by the HSP distance between the chemical and skin. Figure 1‑8 A “first principles” fit to Jmax. Much more encouraging. Note that the previous correlation with water solubility is mostly because water solubility contains a large element of the “crystal” term. · The Crystal and Diffusion terms fight for dominance in a manner that makes intuitive sense from the calculation. In other words, for each molecule we can rationally decide which component is most important in deciding the Jmax. · The HSP activity coefficient correction is often small because many pharma molecules tend to be in the region of [17, 8, 8] (not surprisingly because they have to be generally compatible with the biological system). But the influence can be decisive for the non-pharma chemicals of concern to the general skin permeation community or those concerned with cosmetics which use large concentrations of relatively simple/small molecules. 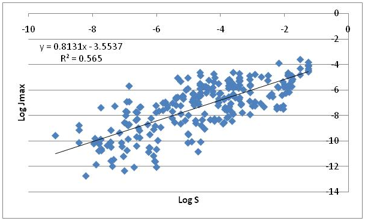 The fact that HSP don’t make dramatic differences across the log-log plot does not mean that HSP can be ignored. Remember that permeation enhancers tend to deliver factors of 2-5 in enhancement. These are trivial in a log-log plot but can make all the difference for a real drug. Because the crystalline (melting-point) term can be so significant, it’s not surprising that HSP cannot make a big difference for big pharma molecules. But by making sure that the vehicle (e.g. 50:50 ethanol:terpene) matches both the skin and the pharma molecule, the all-important factors of 2-5 can come in to play. 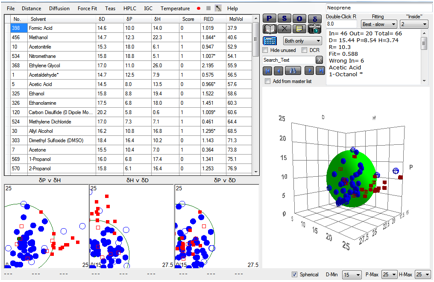 The HSPiP diffusion modeller can readily simulate all these effects. In particular there are two competing issues. The first is concentration dependent diffusion coefficients in the outer layers of the skin. The more, say, ethanol/terpene there is, the higher the diffusion coefficient. The second relates to the fact that the permeation enhancers themselves get depleted across the skin. This reverse gradient can be approximated in the modeller. 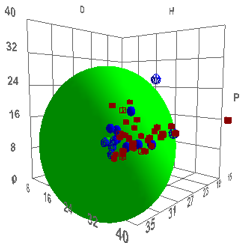 Here is a typical example modelling some real skin diffusion data and providing a quite satisfactory estimate of 21 minutes “lag time” (a key parameter in many skin studies) from the magenta extrapolation of the red flux curve. Figure 1‑9 The diffusion modeller coping both with concentration dependent diffusion and a reverse gradient, whilst providing a classic “lag time” fit to the integrated flux. To remove all doubt, we are not saying that the above correlation proves that the solubility/diffusion approach is the best way forward. But we are saying that the LogKow seems to have produced only a confused literature that is focussing on the wrong parameter (permeability coefficient) rather than the right one (Jmax). And we are not claiming that HSP are dominant in skin permeability of pharma compounds. But we are saying that the HSP provide key insights into the modest effects of skin permeation enhancers and provide a coherent, numerical language for thinking through the effects of the mixtures of components generally found in skin formulations such as ethanol/terpene mixes and in liquid-based formulations found in cosmetics, fragrances etc.